I was thrilled earlier this month when Linda McCauley, who writes Documenting the Details, gave me the “Ancestor Approved Award.” The award was created by Leslie Ann of Ancestors Live Here in March 2010, and has been passed along to many genealogical bloggers. I am honored to be in such wonderful company. Thank you, Linda, for the unexpected but much-appreciated recognition! 1. I was surprised to find my ancestors Samuel and Matilda Wright living in the area served by the Dublin, Ohio post office in 1870. This is the community where I now live. It’s nice to know I have roots here that go back deep into the city’s 200-year history. 2. I was humbled by the hardships suffered by two of my Civil War ancestors, Newel King and John Steele. Newel contracted measles in camp, and endured seizures and ill health the rest of his life. John fell sick on a march, which left him permanently weakened and unable to work. They were just ordinary soldiers, but their stories make the sacrifices of that generation real to me. 3. 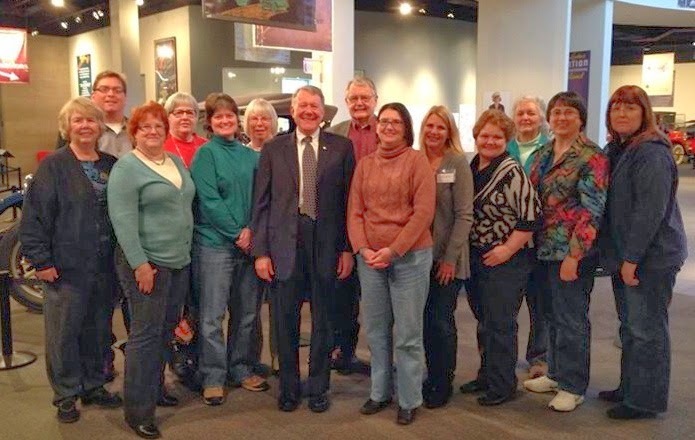 I was humbled, too, by the fortitude of the women of the Civil War generation. Mary Steele applied for a widow’s pension as soon as she was eligible, but it took over a decade of continuously submitting affidavits and forms before her application was approved. In the meantime, she was destitute. Somehow she managed to raise her kids and survive. 4. It was enlightening to discover what my 7th great-grandfather, Johan Adam Rausch, likely experienced when he immigrated to the colony of Pennsylvania in 1736. It was a long, hard journey from the German Rhineland to Philadelphia, with an uncertain future upon arrival. There are so many questions I would love to ask him! 5. It was enlightening to learn about the Revolutionary War service of my 6th great-grandfather, Jacob Roush, who served in a Virginia militia from Dunmore (now Shenandoah) County. He also fought in the Battle of Point Pleasant in Lord Dunmore’s War (October 1774)—a fascinating story of miscommunication and bravery. 6. I was excited to find Jacob Roush then bought land in Gallia County, Ohio, along the Ohio River, in April 1803—just a month after Ohio became a state. His descendents remained in Gallia County for nearly a century. Maybe that’s why I feel a special affinity for southeastern Ohio. I have a long kinship there. Two of my children have carried the connection forward as students at Ohio University in Athens. 7. I was thrilled to discover the original baptismal Fraktur of two of my great-grandparents, John Llewellyn Eberhard and Mary Madina Comfort, in my aunt’s possession. These beautifully illustrated parchments, characteristic of the “Pennsylvania Dutch,” document their births in Lehigh County and are priceless family heirlooms. 8. My husband’s ancestors are just as interesting and inspiring as my own. 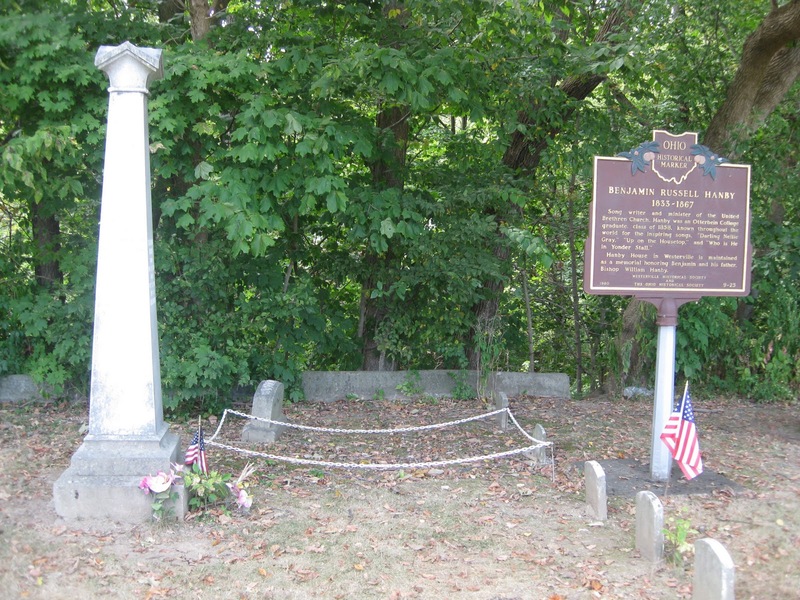 It’s been tremendously satisfying to trace six generations of his family in Portage County, Ohio, and to locate the graves of his 3rd great-grandfather, Fitch Bishop, and 4th great-grandfather, Eli Barnum—both previously unknown. Sharing what I’ve found with my father-in-law has been one of my highlights as a family historian. 9. I am deeply indebted to the ancestors who took up the role of family historian long before me. Christine Steele, Harold Crites, and Harriet Boynton Whiting left written chronologies and summaries that have proven invaluable. Even though they are gone, I feel a sense of partnership with them, almost as if we are collaborating through some transcendence of time. 10. It’s amazing to realize how far back I can go with people I actually knew. 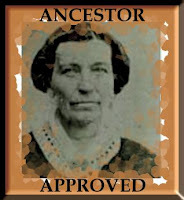 I remember my paternal great-grandmother, Irene (Clark) Ballenger, who was born in 1887. My memories of my maternal great-grandmother, Mabel (Seely) Herrel, born in 1891, are even clearer. Of course I knew these women late in their lives, and only from a child’s perspective. But still, that’s a long reach, and it makes me realize I need to write those memories down. Now. 6. Cheryl at Have You Seen My Roots? 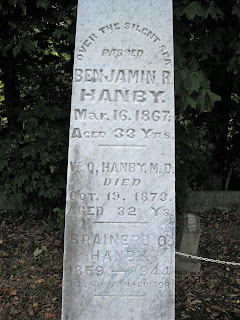 Tombstone Tuesday-Benjamin Hanby: "Up On the Housetop"
Otterbein Cemetery, a pleasant and peaceful graveyard in Westerville, Ohio, is the final resting place of many of my Ballenger ancestors. 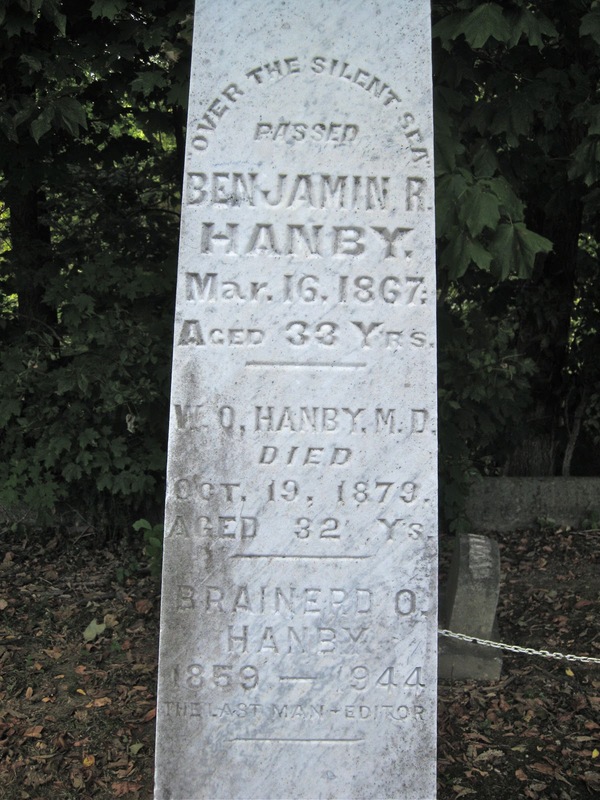 Near their graves is a prominent marker for Benjamin Russell Hanby. Hanby wrote the Christmas carol “Up On the Housetop,” and I thought the holiday season would be the perfect time to share his memorial. W. O. Hanby, M. D.
Hanby House in Westerville is maintained as a memorial honoring Benjamin and his father, Bishop William Hanby. Ho ho ho, who wouldn’t go! Hanby wrote over 80 songs in his short life, according to Ohio History Central. One of these was “Darling Nellie Gray,” an popular anti-slavery song. Hanby and his father were abolitionists who actively participated in the Underground Railroad, sheltering runaway slaves. In 1842, a runaway named Joe Selby died of pneumonia while hiding at the Hanby house. The story Selby told the Hanbys of his quest to be reunited with his sweetheart, Nellie Gray, before he died made a deep impression on Benjamin, who was nine years old at the time. Who would think that a simple Christmas carol could lead to such interesting stories? I couldn’t have written this article six months ago. My MacBook Pro had been humming along flawlessly for nearly three years, and I was complacent. But the warnings from other writers (especially Thomas MacEntee of Geneabloggers) to create a back-up system finally took root. Even though I hoped I’d never need it, I decided I couldn’t risk losing everything. Little did I know I was building a lifeboat that would save me just a few months later. Because this week, my computer's hard drive died. I started getting the spinning beach ball that every Mac user dreads more and more often, and time and again it ground my system to a halt. I thought maybe I had contracted some sort of rare virus or malicious spyware. Frustrated, I made an appointment with the Genius Bar at my local Apple store on Friday. The technician did a diagnostic check and gave me the bad news: my hard drive was going down. The only option was to replace it. Was I backed up? I swallowed hard and said yes. Fortunately, there was some good news as well. The part was in stock, and a kind soul in the back had offered to do the replacement overnight. I left the store with an empty case and a worried mind. Would the backup really work? 1. Reunion for iPhone: my genealogy files on Reunion were synced to my iPod Touch. Reverse syncing, from the mobile device to the computer, is also possible, so I knew my data was safe. 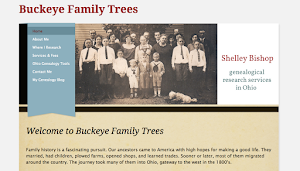 Lesson: if your genealogy program of choice offers a mobile version, get it and use it. 2. Mozy: over the summer I subscribed to the online backup service Mozy. Although the initial transfer of data was a lengthy process, for the most part it seems to have worked smoothly. So I figured if worse came to worse, I could retrieve my documents, photos, music, genealogy, and other files by requesting a restore disk. Lesson: a cloud backup gives great peace of mind for a reasonable price tag. Though I didn’t end up needing it, this is added insurance, especially in the event of a disaster that could destroy both the computer and a physical backup drive. 3. Time Machine and a backup hard drive: just this fall, I finally upgraded to the Leopard operating system (Mac 10.5), which includes the backup program Time Machine. I purchased an Iomega eGo portable hard drive formatted for Mac. Time Machine transferred an exact copy of my entire system to the Iomega drive quickly and effortlessly. Since then, I’ve backed up every night before going to bed (you can also set it to run automatically). Lesson: a portable hard drive combined with good backup software is an unbeatable combination. Prices on these drives have come way down; mine cost $70. You literally can’t afford not to have one. When I picked up my computer Saturday afternoon, the technician walked me through the steps I’d be taking. Turn the computer on. Select my country and language. When prompted whether I want to transfer from another source, select to transfer from Time Machine. Plug the Iomega drive into the computer. Select the drive, click continue, and wait for Time Machine to do its magic. Simple enough. And it worked! In just about an hour’s time, my familiar desktop picture appeared onscreen, with all the little icons in their right places. Nothing was missing, nothing was changed. All my bookmarks, all my settings, and all my applications worked perfectly. After doing a little happy dance through the kitchen, I went out to eat with my family, celebrating my son’s return from a semester abroad (he was in transit at the same time my computer failed, and I have the extra gray hairs to show for it). The moral of the story is: it can happen. Chances are, it will happen, and possibly at a most inconvenient time. If you don’t have a backup drive, put one at the top of your wish list, or just buy it yourself. Don’t wait to use it. My husband and kids are getting portable drives for Christmas. In the scheme of things, my experience with hard drive failure was relatively painless—a hiccup rather than a catastrophe. My holiday wish is for you to have the peace of mind of knowing that, should you find yourself in a similar situation, your experience will be as painless as possible, too. 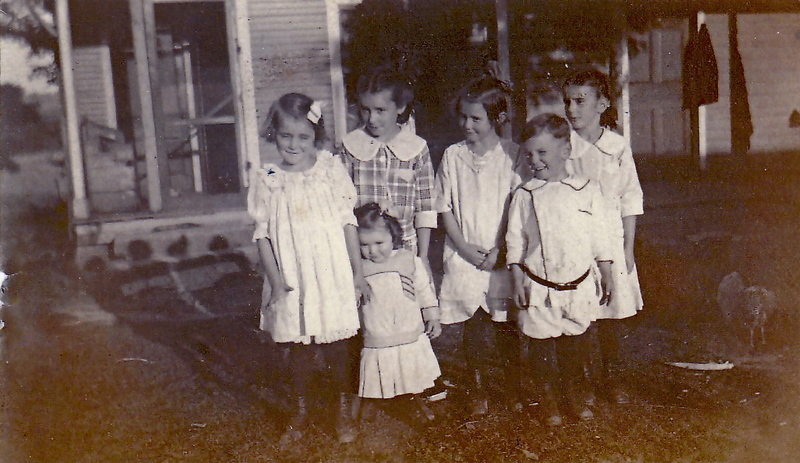 My grandmother, Nora Eberhard (subject of my COG post, "The Life of the Party"), and some of her siblings on the family farm near Galena, Ohio, about 1918. From left to right are Bertha Alice, born April 12, 1911; Georgia Madina (in front), born December 12, 1915; Carrie Marie, born January 19, 1908; Nora Belle, born March 16, 1910; Robert John (in front), born May 9, 1912; and Anna Lephia, born February 13, 1909. Eight older and two younger siblings are not pictured. The children appear to be dressed up for a special occasion, and look happy and excited. From their clothing, it seems to be summertime. This is the earliest picture I have seen of my grandmother.